Don't let those low tops throw you for a loop—these shoes are boots. Of course, it feels funny saying this given that a boot must have support at or above the ankle to be deemed as such. But, after putting the Danner Mountain 600 Low through many hours on rough trails in wet conditions, I would say this "shoe's" support rivals that of any hiking boot that currently occupies my closet. 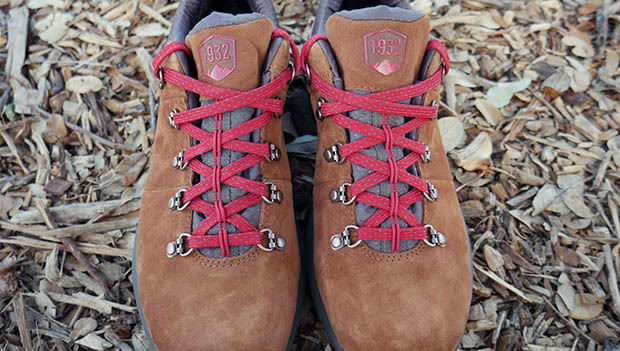 And, with its handsome, solid suede construction, D-ring eyelets and thick, Vibram rubber soles, the Mountain 600 easily takes on the appearance of a rigid hiking boot. Yet its lightweight construction and flexibility give your trotters the feel of being in a comfy shoe. While you can get the Mountain 600 in a traditional boot form with high ankle support, as someone who routinely opts to hike in trail runners over traditional boots, I appreciate the low tops for its lack of constriction and its versatility. This makes Danner's most advanced pair of hiking footwear the perfect marriage between boot and shoe. The first thing you'll notice about the Mountain 600 Low is its monotonous suede toe box and upper that, while lacking in eye-catching mesh or a distinct design, is more importantly lacking in seams. Add to this a water-resistant tongue webbed together with the shoe's upper, and you have a watertight footwear for your next hike. The Mountain 600 also features D-ring eyelets for durability and easy adjustment and a thick, Vibram midsole made from a co-polymer blend that includes synthetic natural rubber and Ethylene Vinyl Acetate (EVA) (or "really awesome stuff," in layman's terms). The shoe also includes one of the grippiest outer soles I've ever tested on a shoe (more on this later) and a convenient suede pull tab that's becoming harder and harder to find on hiking shoes. And yet another clever inclusion is the four lace keepers that travel up the tongue of the shoe to prevent it from sliding. This shoe’s construction is meant to withstand any condition Mother Nature might throw your way. Ultimately, this shoe's construction is meant to withstand any condition Mother Nature might throw your way, and its solid, traditional boot design with subtle accents gives the Mountain 600 a 10 out of 10 on the appearance scale from me.